This gem dates back to my childhood when a series of flashing lights could be considered a "game" worthy of one's time and money. 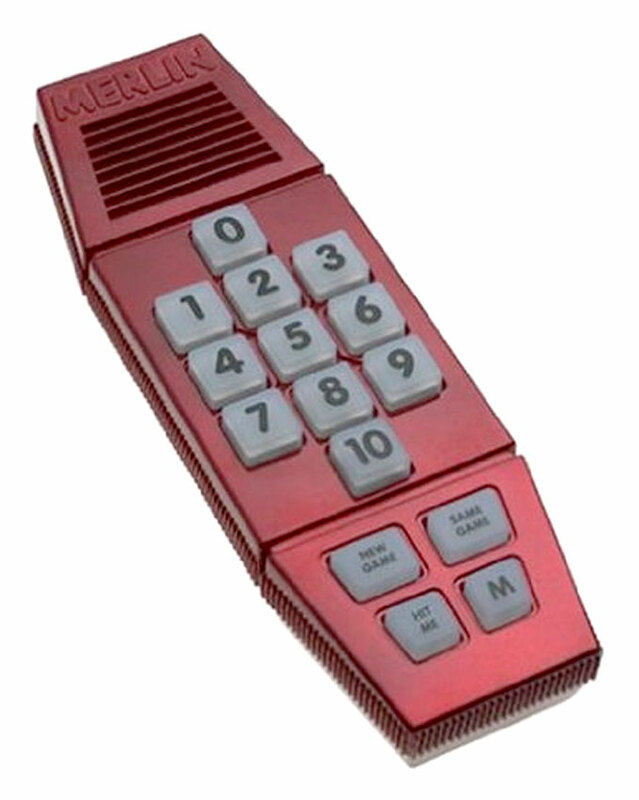 This Merlin unit was the first handheld game I ever owned. 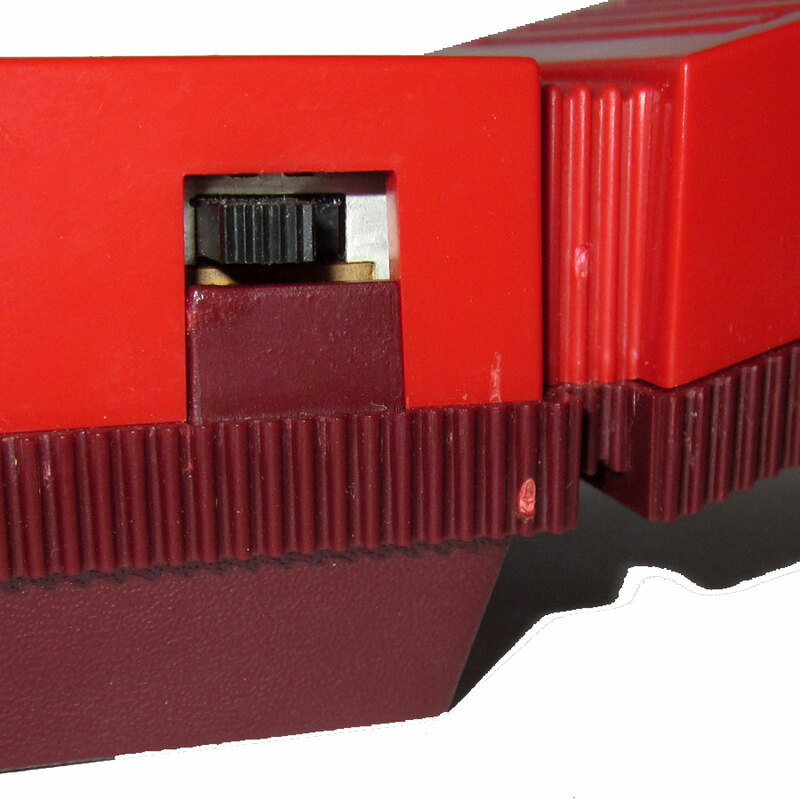 It comes from the same era as the Mattel handheld sports games. 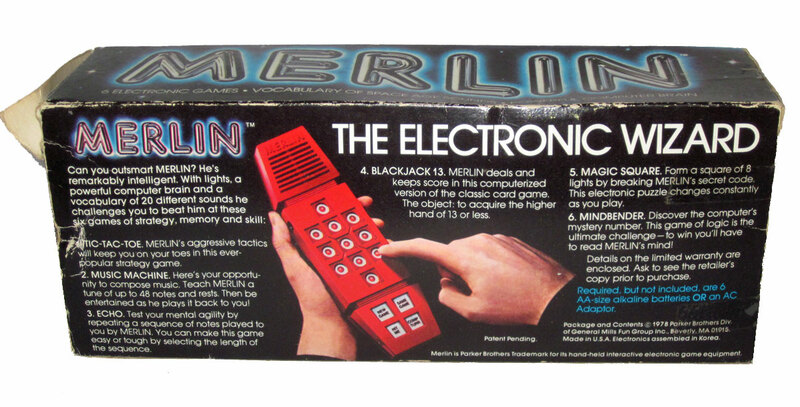 Merlin (aka: The Electronic Wizard) was a handheld electronic game made by Parker Brothers in 1978. 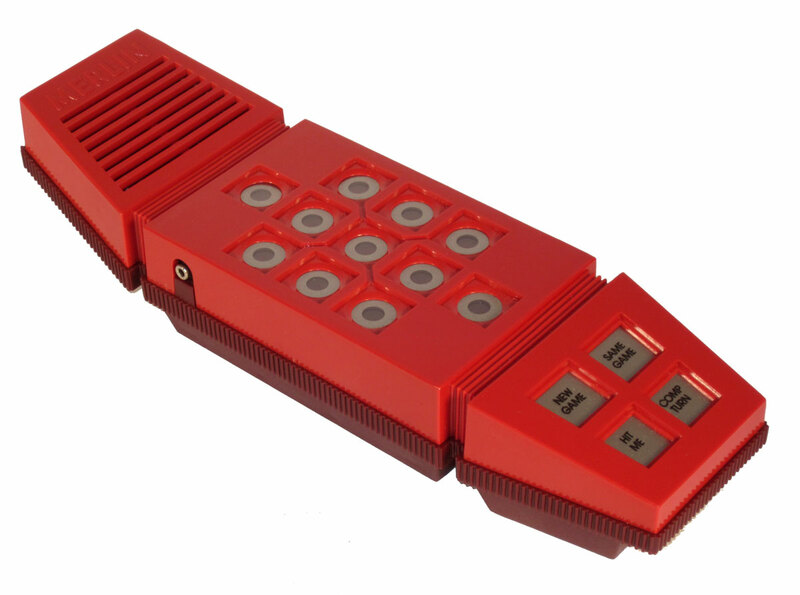 Merlin is notable as one of the earliest and most popular handheld games, selling over 5 million units during its initial run. It remained popular throughout the 80s. A version of the game was re-released by the Milton Bradley Company. We have scans of the entire Merlin Instruction Manual. 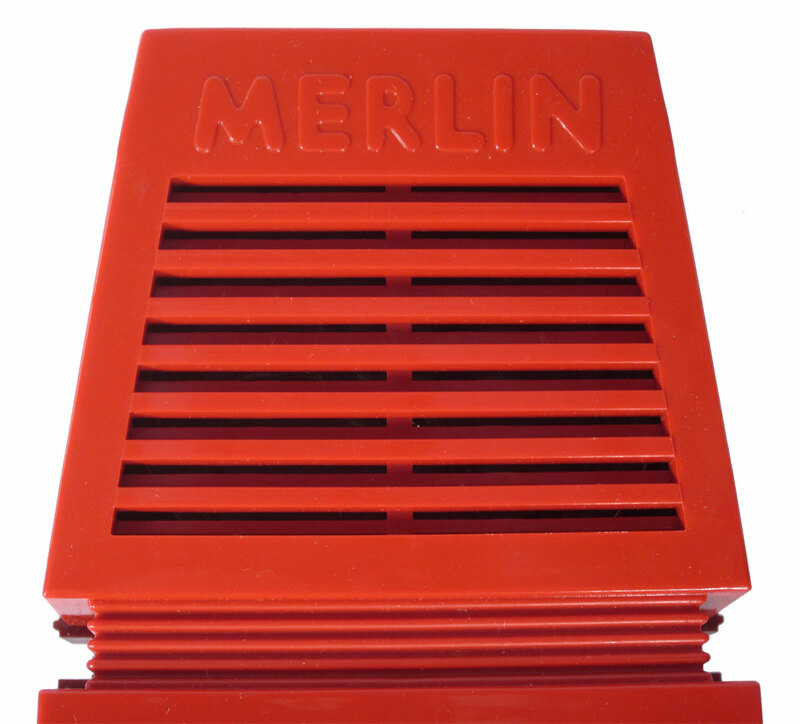 Front of the Merlin box. Merlin was created by Bob Doyle, a Harvard PhD and inventor who had previously worked with NASA. Back of the Merlin box. 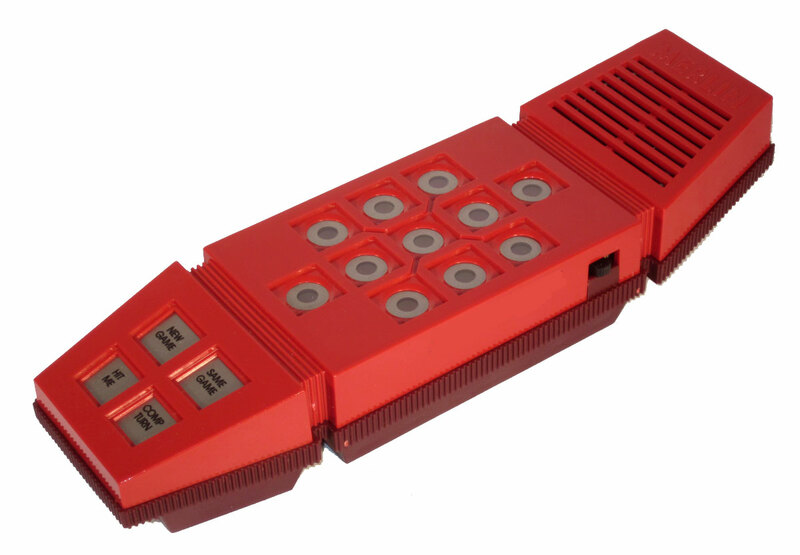 The play area of the game consisted of a matrix of eleven buttons; each button contained a red LED. The Merlin instruction manual shows how to play all the games as well as providing a few songs - via numeric input - for some tunes to try with Music Machine. View the entire Merlin Instruction Manual. Top view of the Merlin handheld gaming unit. The Music Machine game functioned as a musical instrument; in this mode each key was assigned a musical note, and sequences of notes could be recorded and played back. 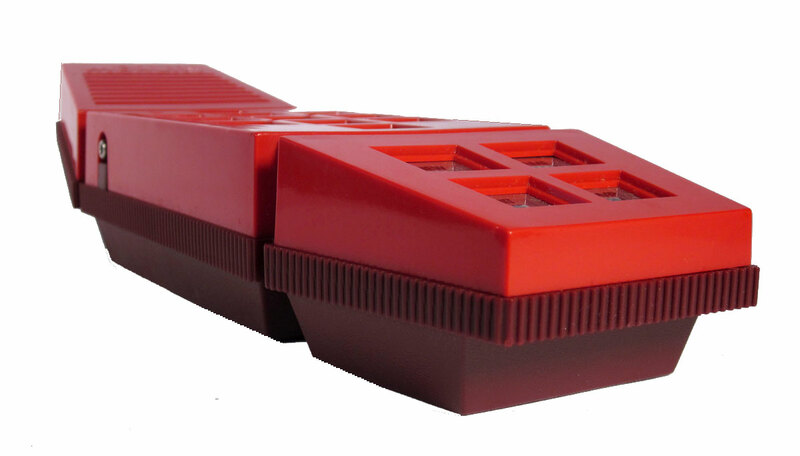 This made Merlin one of the earliest sequencers as well as an early consumer-level electronic synthesizer. Left side of the Merlin handheld showing the 1/8" headphone jack. 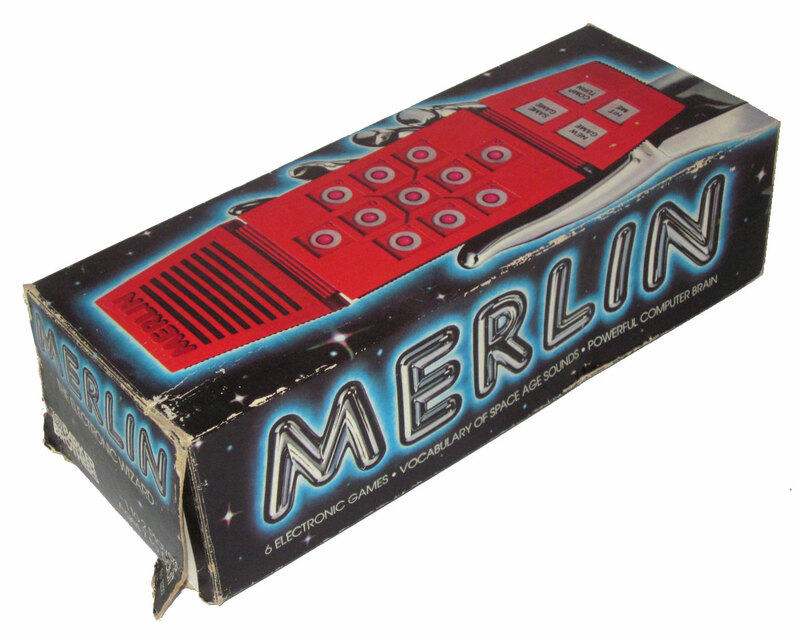 The Toy Manufacturers of America named Merlin the best selling Toy and Game Item in America in 1980, selling 2.2 million units. Right side of the Merlin handheld showing the power switch. Merlin has been featured on TV shows - I Love the '70s: Volume 2, My Name Is Earl, Fantasy Island and Firefly. Side view of the Merlin handheld. 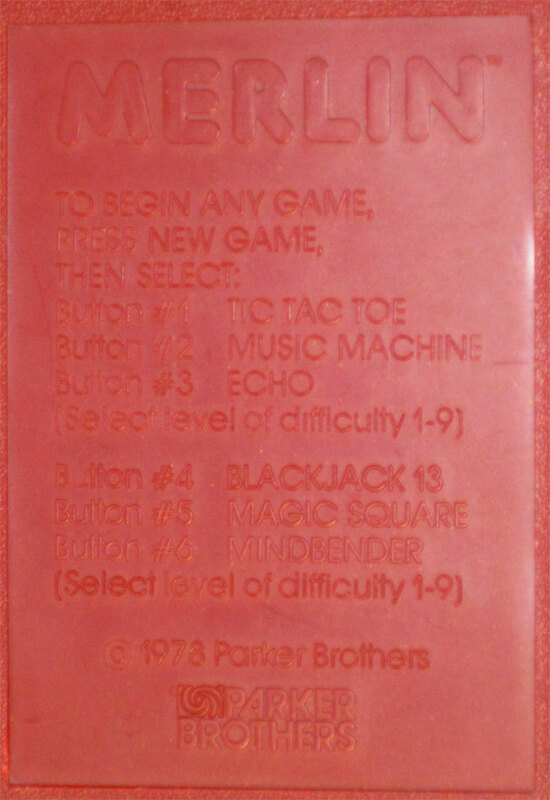 Bottom of the Merlin handheld showing basic game info on the outside of the battery compartment. 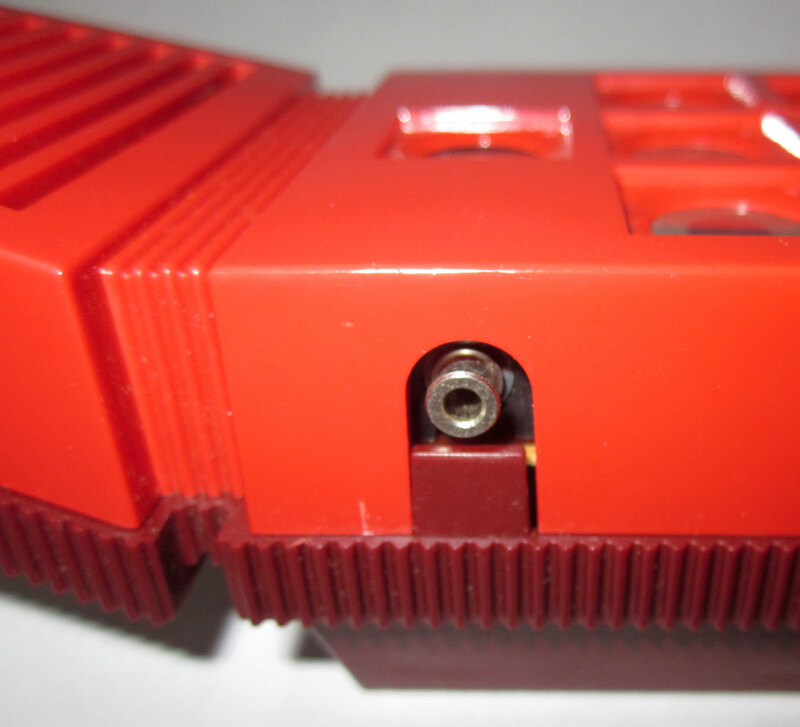 Close-up detail of the basic game info on the outside of the battery compartment. The speaker was at the top end of the Merlin handheld. The illuminated game buttons located in the center of the Merlin handheld. All of it's built-in games used these lights for game-play. they were also labeled 1 through 10 for games that couldn't rely solely on the lights. Game selection option buttons located at the bottom of the Merlin handheld. The power switch on the right side of the Merlin handheld. The headphone jack on the left side of the Merlin handheld. 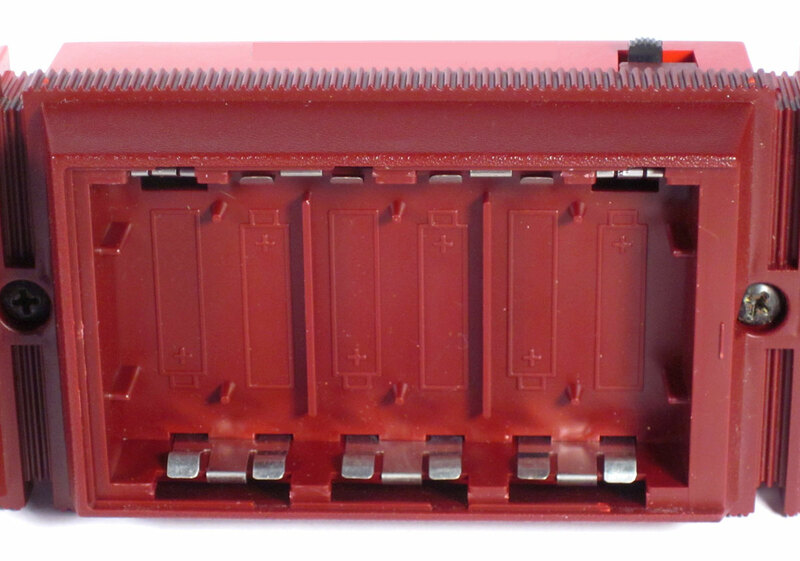 The battery compartment with the slide-away door removed. The unit operated on 6 AA batteries. 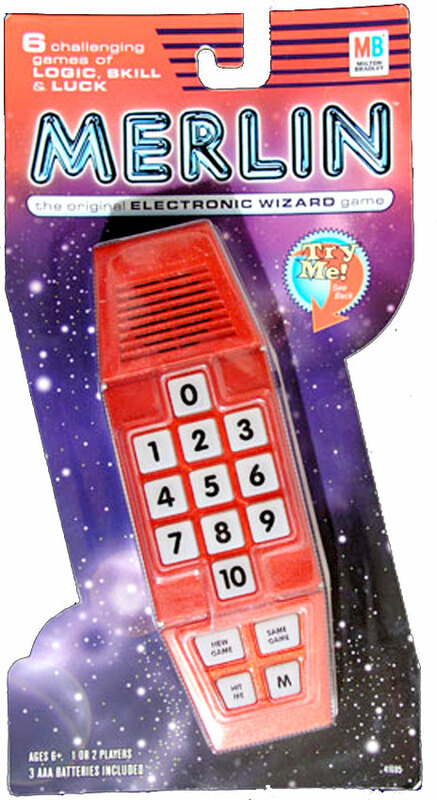 Milton Bradley's re-issue of the Merlin handheld. 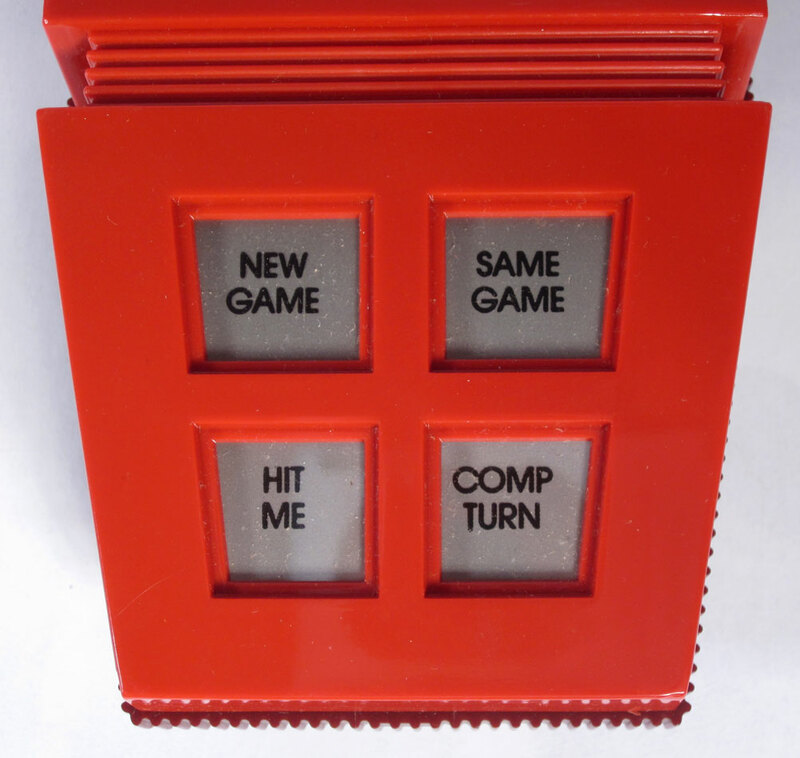 It is approximately the same size as the Parker Brothers original (1.2 x 5.5 x 10.5 inches | 6.4 ounces) and offers 6 games - Tic Tac Toe, Music Machine, Echo, Blackjack 13, Magic Square, and Mind Bender. Milton Bradley's flat-pack version is smaller than the unit above.